“We’re thrilled to report that our holiday quarter results generated Apple’s highest quarterly revenue ever, and broke multiple records along the way. We sold more iPhones than ever before and set all-time revenue records for iPhone, Services, Mac and Apple Watch,” said Tim Cook, Apple’s CEO. “Revenue from Services grew strongly over last year, led by record customer activity on the App Store, and we are very excited about the products in our pipeline.”--January 31st press release, infra. Summary: revenue $78.4B (+3.3% Y/Y) beat estimates), EPS $3.36 beat estimates, share repurchases and dividends $15B. $AAPL shares UP in after hours trading Jan 31, 2017. LIVE streaming of Apple's Q1 2017 financial results conference call 2:00 p.m. PST on January 31, 2017 at www.apple.com/investor/earnings-call/. This webcast will also be available for replay for approximately two weeks thereafter. Apple posted all-time record quarterly revenue of $78.4 billion and all-time record quarterly earnings per diluted share of $3.36. These results compare to revenue of $75.9 billion and earnings per diluted share of $3.28 in the year-ago quarter. International sales accounted for 64 percent of the quarter’s revenue. Declared a cash dividend of $0.57 per share of the Company’s common stock. 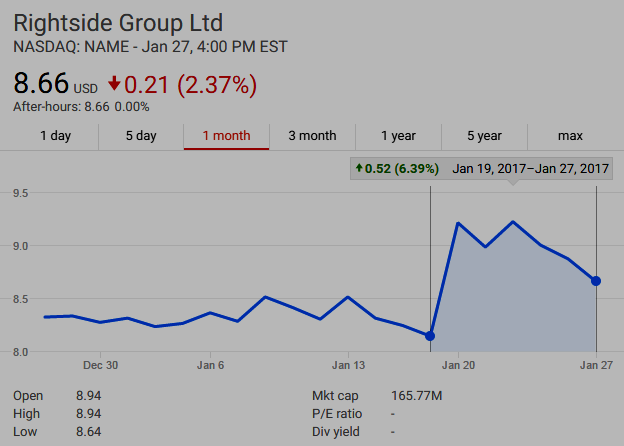 The dividend is payable on February 16, 2017 to shareholders of record as of the close of business on February 13, 2017. Can Apple come out of its recent earnings doldrums through higher prices for iPhones? WSJ.com's Tripp Mickle explains on Lunch Break with Tanya Rivero. Video above published Jan 30, 2017. Apple wobbly? "I thought one of the big four (Apple, Google, Facebook, Amazon) would falter in 2016. All produced positive stock performance in 2016. None appear to have faltered in a huge way in 2016. But Apple certainly seems wobbly. They can’t make laptops that anyone wants to use anymore. It’s no longer a certainty that everyone is going to get a new iPhone when the new one ships. The iPad is a declining product. The watch is a mainstream flop. And Microsoft is making better computers than Apple (and maybe operating systems too) these days. You can’t make that kind of critique of Google, Amazon, or Facebook, who all had great years in my book." --Fred Wilson, What Did And Did Not Happen In 2016 | AVC.com. MacroView Feature • Trump has now been President for nine days (noon Jan 20 - noon Jan 29) as I write this--and for those who really think that Friday Executive Order is the only thing that matters, I'll get this out of the way up front, read: Donald Trump’s Refugee Executive Order: No Muslim Ban -- Separating Fact from Hysteria | NationalReview.com. Held an important meeting in Washington with UK Prime Minister Theresa May, renewing and reaffirming the US-UK "special relationship" and covering a wide range of topics from trade (Trump is a strong supporter of Brexit as well as a new bilateral US-UK trade agreement), to security, Russia, and NATO. Trump also accepted an invitation to visit Britain and meet the Queen on an official state visit later this year . Told the executive and legislative branches of the U.S. government to prepare for, and enact, the repeal and replacement of Obamacare. Ordered a hiring freeze for the federal government, excluding military and the VA. Withdrew from TPP--the Trans-Pacific Partnership trade agreement. Cut off federal funding to foreign charities that provide abortions. Called for cuts in U.S. regulations. Issued executive orders resurrecting the Keystone Pipeline and Dakota Access Pipeline projects which had been halted by the Obama administration. Trump also included a provision that the pipelines use only U.S. labor and materials--one estimate of the Keystone pipeline's job creation (pdf) says that project alone will support roughly 250,000 permanent jobs in the U.S. See also Canada's Prime Minister Justin Trudeau welcomes Trump's Keystone XL decision | CBC.ca. The Wall's going to get built and we know the Trump administration is working on ideas of how Mexico will actually "pay for it." Trump held a telephone conference (for more than an hour) with the President of Mexico, and issued a Joint Statement afterwards. By Executive Orders told U.S. government agencies and border, customs, and immigration personnel to enforce the law, ending "catch and release" and sanctuary cities. Held meetings with business leaders and U.S. labor leaders. Traveled on Air Force One to speak and meet with House and Senate Republicans at their annual retreat in Philadelphia. Spoke at the Pentagon at Defense Secretary Mattis's swearing-in ceremony and personally greeted the troops. Snubbed the Washington establishment's elitist Alfalfa Club. Ordered a 'defeat ISIS' plan, talked with Putin and gave Bannon a national security role. And much, much more ... with more to come this coming week. "I'm not talking about everybody, but a big portion of the media--the dishonesty, total deceit and deception. It makes them certainly partially the opposition party, absolutely. I think they're much more capable than the opposition party. The opposition party is losing badly. Now the media is on the opposition party's side." And as Mike Allen and Jim VandeHei wrote above, the sideshows and media hysteria distract from the real events occurring in plain sight and under the radar that investors (and the public) need to know about. Unfortunately, mainstream media never got over getting the election so wrong ("Trump has no path to 270 electoral votes"), so they abandoned all pretense of journalistic ethics, and wasted weeks unsuccessfully working hand-in-hand with the neo-con/neo-liberal Washington establishment in an attempt to de-legitimize Trump's election, a media crusade which probably reached its nadir with Obama's Democratic-appointee-led "intelligence community" leaking (directly or indirectly), a smear in the form of an unvetted "Russian dossier" published by BuzzFeed which was then given wide coverage through links on CNN and coverage by other major media news operations. Read: The Reason You Can’t Stand the News Anymore. | Medium.com: "The methods used to fund modern journalism simultaneously undermine trust in the news outlets." That's right, the business models of most news organizations are broken and they are failing financially. Google and Facebook are sucking up most digital ad revenues. News media are desperately competing for clicks, and it is showing--the public have lost trust in the media. Even Margaret Sullivan of the Washington Post has taken notice. So what's an investor (or member of the general public) to do? Unless you want to be swamped by the distortion, noise, spin, and outright false or #FakeNews, you have to carefully consider the source of anything you read or hear, and take time to curate your sources of "news and information." Here's one list I've curated. • Jeff Gundlach predicted Trump would win, what's he think now? 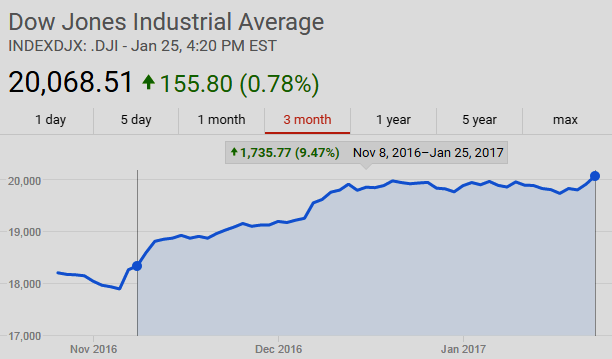 "It’s typical for the stock market to go up until the inauguration and then fall. It happened with Ronald Reagan, too. I think we will see something similar—it will have a pullback, at a minimum. There will be an attempt to build infrastructure and borrow a lot of money to do it. There will be potential for a pick-up in growth, an increase in interest rates, which has already happened, and potential for inflation." --Invest Like a Legend: Jeffrey Gundlach | TheGlobeandMail.com: "... being successful in investing is to understand human nature." • Economist: Stock Market Gained $2T in Wealth Since Trump Elected | FoxNews.com and U.S. Rally Is the Envy of Stock Markets Worldwide | WSJ.com: "... U.S. stock markets have rallied since the President’s victory more than two months ago, rising on improved economic data and hopes Mr. Trump can stimulate the economy with tax cuts and infrastructure spending while rolling back regulations. But most major stock markets around the globe haven’t enjoyed the same postelection bump, and many remain far below their record levels ..."
• Brexit Update: London Bankers May Dodge One-Way Trip to Frankfurt | Lipper Alpha Insight | ThomsonReuters.com. One More Thing: Pundits, Facts and the Future | Bloomberg.com: "News media provide an opportunity for rampant confirmation bias ... for investors, as most of what is news is not only old, it often already is reflected in market prices ... "
ICANN New gTLDs' Covenant Not To Sue Sinks Donuts, DCA Trust Next? | DomainMondo.com Dec 1, 2016: "If Ruby Glen (Donuts) does appeal, that could be doing ICANN a big favor as ICANN would like a published Ninth Circuit Court of Appeals opinion affirming Judge Percy Anderson and enforcing the Covenant Not To Sue, which could then be cited as legal precedent in any case brought by new gTLD applicants, now, or in future rounds of new gTLDs." Ruby Glen, LLC v. ICANN | ICANN.org: Amended Complaint's prayer for relief: "WHEREFORE, Plaintiff RUBY GLEN, LLC prays for relief as follows: 1. For compensatory damages according to proof at the time trial; 2. For general damages according to proof; 3. For restitutionary damages according to proof; 4. An injunction requiring ICANN to refrain from conducting the auction of last resort for the .WEB gTLD pending a final decision on the merits of this matter; 5. An injunction requiring ICANN to refrain from entering into a Registry Agreement with any party for the .WEB gTLD pending a final decision on the merits of this matter; 6. An injunction requiring ICANN to refrain from assigning the rights to the .WEB gTLD to any party pending a final decision on the merits of this matter; 7. Attorneys’ fees and costs to the extent permitted by law; and 8. For such other relief as the Court deems just and proper against all Defendants." "I really can’t see a legitimate upside where new benefits outweigh costs, and everyone I mention this to feels the same way. People just shake their heads. It’s all about the money. 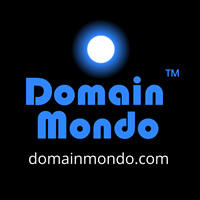 They [ICANN] are creating these [new gTLDs] extensions because they can." --Wharton marketing professor Peter Fader, May 21, 2014, Domain Name Land Rush: More Room for Companies, Competition and Scam Artists | knowledge.wharton.upenn.edu. • Adding up the costs of ICANN's new gTLDs: INTA Impact Study on Costs of New gTLDs | inta.org January 15, 2017. • Coping with ICANN's new gTLDs--Question submitted at Mark Monitor's webinar this past week on Top Domain Management Strategies for 2017: Q: Defensive registrations to save enforcement costs = caving in to ICANN's new gTLDs extortionate business model. What happened to the "global public interest"? Does the internet really need more than a thousand TLDs? • Draft Report of the Competition, Consumer Trust and Consumer Choice Review Available in January | ICANN.org 21 Dec 2016: "... Although we initially planned to release the draft report in December, we believe it is prudent to take additional time to obtain additional information that will allow us to support our analysis. Before the end of the year, we expect to receive a report on a survey of new gTLD applicants as well as a response from Analysis Group (the study authors) to the public comments on the Phase II Assessment of the Competitive Effects Associated with the New gTLD Program. We intend to publish the draft report for public comment here in January 2017. Stay tuned! ..." Status? As of January 29, 2017, 00:00 UTC, draft report not published. • Internet freedom isn’t free: five years after the SOPA PIPA blackout | TheHill.com and 5 Years Later, Victory Over SOPA Means More than Ever | Electronic Frontier Foundation | eff.org. • Will The Internet Always Be American? (video) | YouTube.com: video of Future Tense Jan 24th program in Washington, D.C., to "explore the internet’s nationality, the extent to which it’s an expression of American culture, and to ask if that's about to change." A notice from China's Ministry of Information and Technology says that all virtual private networks (VPNs), which allow Chinese internet users to access blocked overseas websites, will have to be authorized by Chinese telecom regulators. The move is likely to make most current providers of VPNs in China unlawful, reports the South China Morning Post | scmp.com. Virtual private network (VPN) services allow Chinese internet users to bypass internet restrictions in China known as the Great Firewall. 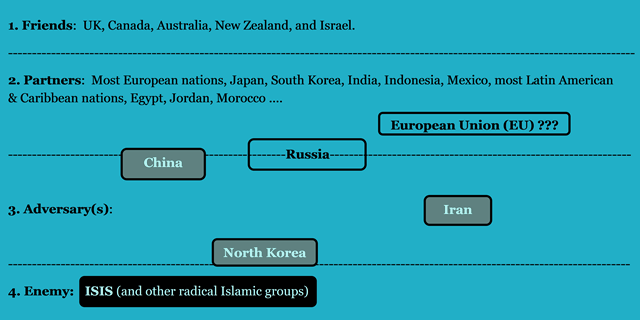 See also: China cracks down on unauthorized internet connections | Reuters.com. China Slams Western Democracy as Flawed | Bloomberg.com: "China’s rising wealth has brought greater global presence, but that’s not enough. The Communist leaders want that someday China will matter globally for the nature of its political system and create its own universal values.”--Zhang Ming, a political science professor at Renmin University in Beijing. Document of Torture: One Chinese Lawyer’s Story From Jail | China Real Time Report | WSJ.com: The use of torture to extract confessions is commonplace in China, lawyers and human-rights group say, and many of the techniques Mr. Xie described to his lawyers have been previously documented in reports by groups like Amnesty International and Human Rights Watch. Lawyers and activists said Mr. Xie’s account is nevertheless striking for its clarity, and for how it illuminates the territory Chinese authorities are willing to tread in their campaign against lawyers they see as threatening. • Internet shutdowns in Africa: Kenyan government warns of possible internet shutdown in August elections | htxt.co.za and Cameroon Pressures Mobile Operators to Shut Down Internet | DomainNewsAfrica.com. • Europol chief: ′Internet a more significant facilitator of crime and terrorism than Schengen′ | Europe | DW.com. News Review: New gTLDs Registry Rightside Sells eNom, What's Next? AdParlor.com CEO Ben Legg breaks down Alphabet’s results and the importance of YouTube to Google in the TV advertising market. He speaks with Caroline Hyde on “Bloomberg Technology.” on January 26, 2017. Also discussed: Facebook and Twitter. See also Alphabet $GOOG $GOOGL Q4 2016, LIVE Webcast Jan 26, 4:30pm ET. • Tidal/Sprint | Lefsetz.com: "First and foremost, he [Jay Z] doesn’t know the first rule of the internet, which is one company ends up with seventy percent of the market. There’s no room for Tidal, Spotify’s already gobbled up the market share ... Peter Thiel wrote that you go into a business where no one else is. That’s how you make your money." • Cloud Computing Spins Out Of Control (But Maybe That's Not Such A Bad Thing) | forbes.com: "The ubiquitous access to technology resources and services provided through cloud is providing almost unlimited opportunities for innovation at every level of organizations." • FY17 Q2 Microsoft | microsoft.com: Microsoft reported Surface revenue down 2% YoY to $1.32B as Azure revenue increased 93% and Phone revenue declined 81%. Revenue was $24.1 billion GAAP, and $26.1 billion non-GAAP. Operating income was $6.2 billion GAAP, and $8.2 billion non-GAAP. Net income was $5.2 billion GAAP, and $6.5 billion non-GAAP. See also Microsoft's market value tops $500 billion again after 17 years | Reuters.com and The biggest barrier to Windows 10 success is still Windows 7 | ZDNet.com: "The fate of Windows 10 lies in the hands of users that are still deeply in love with Windows 7." • Q4 2016 earnings this past week on DomainMondo.com: Alibaba $BABA, Qualcomm $QCOM, Alphabet (Google) $GOOG, $GOOGL. 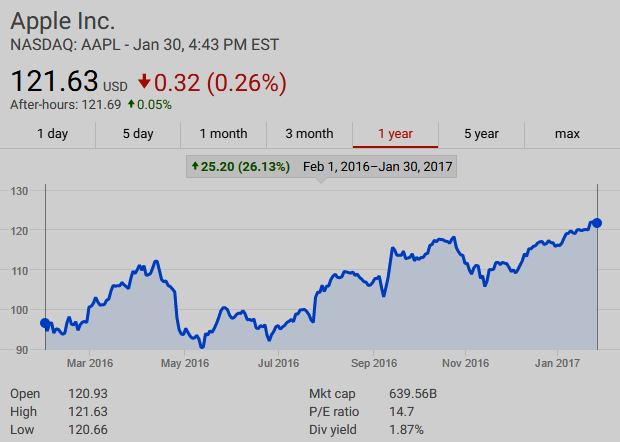 • Earnings releases this coming week on Domain Mondo: Apple $AAPL (Jan 31), Facebook $FB (Feb 1), and Amazon $AMZN (Feb 2). • Mathematical Model Reveals the Patterns of How Innovations Arise | technologyreview.com: "... innovation arises from the interplay between the actual and the possible was first formalized by the complexity theorist Stuart Kauffmann. In 2002, Kauffmann introduced the idea of the “adjacent possible” as a way of thinking about biological evolution. The adjacent possible is all those things—ideas, words, songs, molecules, genomes, technologies and so on—that are one step away from what actually exists. It connects the actual realization of a particular phenomenon and the space of unexplored possibilities. But this idea is hard to model ..."
AppDynamics IPO: How Cisco swooped in and bought the company | Fortune.com: "How the Last Minute, $3.7 Billion AppDynamics Deal Went Down." How executives make the tough calls in a demanding industry. Video published Nov 14, 2016 by Stanford Graduate School of Business (Stanford GSB), domain: gsb.stanford.edu. 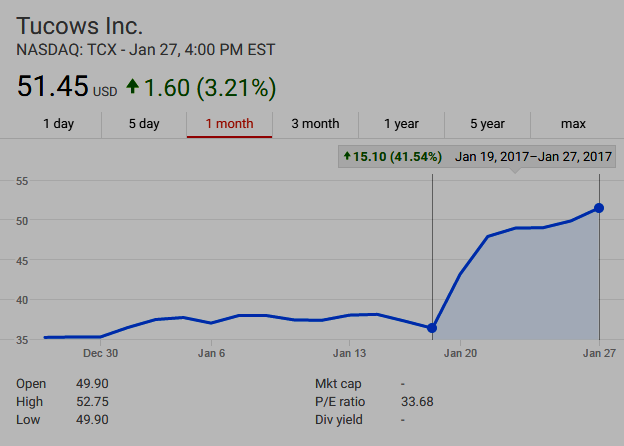 Alphabet Inc. (NASDAQ: GOOG, GOOGL) conference call and webcast to discuss fourth quarter and fiscal year 2016 financial results on Thursday, January 26th, at 4:30 p.m. ET (US). Q4 EPS of $9.36 missed estimates by $0.26, while revenue of $26.06B (+22.2% Y/Y) beat by $830M. Shares down in after-market trading. Founded as Google in September 1998, the company now known as "Alphabet" has grown to more than 60,000 employees worldwide, with a wide range of products, platforms, and services such as Search, Maps, Ads, Gmail, Android, Chrome, and YouTube. In October 2015, Alphabet became the parent holding company of Google. More about Alphabet’s mission here. Diane Greene, Senior Vice President, Google Cloud, will participate in the Goldman Sachs Technology and Internet Conference in San Francisco, California, 11:45 a.m. PT / 2:45 p.m. ET (US) on Tuesday, February, 14, 2017. To access the live audio webcast of the session, please click here. Google for Education intros two Chromebooks with stylus capability | engadget.com: The Acer Chromebook Spin 11 and the Asus Chromebook C213 will be available in late spring. Chrome OS Systems Supporting Android Apps - The Chromium Projects | google.com: "All Chromebooks launching in 2017 and after as well as the Chromebooks listed here will work with Android apps in the coming future." Ringing in 2017 with updates to our Google Voice apps | blog.google: "Going forward, we’ll provide new updates and features to the Google Voice apps. If you currently use Hangouts for your Google Voice communication, there’s no need to change to the new apps, but you might want to try them out as we continue to bring new improvements." U.S. (FTC) antitrust suit against Qualcomm for allegedly using unfair practices in the way it licenses its technology. Bloomberg's Ian King and Cory Johnson discuss on "Bloomberg Technology," January 17, 2017. Qualcomm Incorporated is a US-based (San Diego) multinational semiconductor and telecommunications equipment company that designs and markets wireless telecommunications products and services. The parent company includes the Qualcomm Technology Licensing Division (QTL). The wholly owned subsidiary, Qualcomm Technologies, Inc. (QTI), operates substantially all of Qualcomm's R&D activities, its product and services businesses, including its semiconductor business, Qualcomm CDMA Technologies. Listen to webcast -- Executive Presentation (pdf 227.4 KB) -- Q1 EPS of $1.19 beat consensus estimate by $0.01 and revenue of $6B (+4.0% Y/Y) missed by $120M. News release (pdf). Qualcomm Comments on Apple Complaint | Qualcomm.com: "... Apple’s claims are baseless. Apple has intentionally mischaracterized our agreements and negotiations, as well as the enormity and value of the technology we have invented, contributed and shared with all mobile device makers through our licensing program. Apple has been actively encouraging regulatory attacks on Qualcomm’s business in various jurisdictions around the world, as reflected in the recent KFTC decision and FTC complaint, by misrepresenting facts and withholding information." Qualcomm Responds to Complaint from U.S. Federal Trade Commission | Qualcomm.com: "The FTC’s allegation to the contrary -- the central thesis of the complaint -- is wrong." Qualcomm: Apple War Could Ravage Chipsets Or Licensing Fees - Qualcomm Inc. (NASDAQ:QCOM) | SeekingAlpha.com: "Qualcomm has a $32 billion war chest - a $1 billion lawsuit would not have a material impact on the company. However, a reduction of its licensing fees could." Qualcomm Responds to Announcement by Korea Fair Trade Commission | Qualcomm.com: "Decision Not Effective Until Final Written Decision is Issued — Qualcomm will Vigorously Defend Itself and Seek an Immediate Stay When Final Decision is Issued — Dec 27, 2016"
Excerpt from Apple's complaint: "Apple has been indirectly paying Qualcomm licensing fees since 2007, when it released the iPhone. Apple became even more reliant on Qualcomm in 2011 due to Apple's desire to release an iPhone that could connect to CDMA networks, such as Verizon's. For many years, Qualcomm ensured that it was the only possible supplier of CDMA chipsets, and it remains so today for the chipsets used in Apple's flagship iPhone product line. As a monopoly supplier of an essential input, Qualcomm had the power to constrict and disrupt chipset supply, which (coupled with Qualcomm's refusal to enter into industry-standard supply agreements that would have guaranteed supply to Apple, absent unusual or unforeseen circumstances) would have been disastrous to Apple's business." When To Buy Qualcomm? 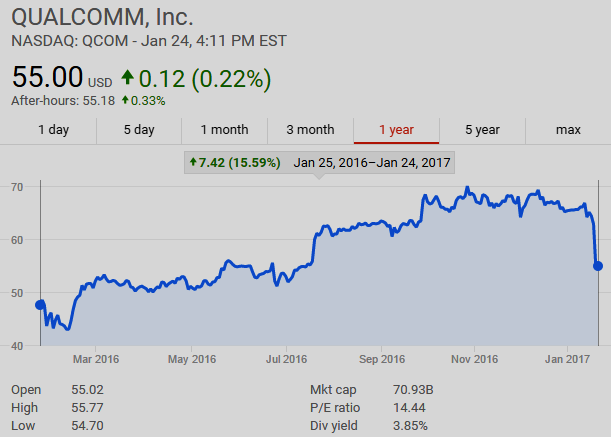 - Qualcomm Inc. (NASDAQ:QCOM) | SeekingAlpha.com: "Investors generally purchase a stock for two reasons: capital appreciation and dividends. So, the astute long-term investors who are not worried about the noise will likely enter the stock as it heads lower keeping the increasing dividends in mind. QCOM is a gem of dividend-growth stock." Video above published Jan 18, 2017: Globalization of business is good, but it hasn’t been good enough so far, said Alibaba Executive Chairman Jack Ma. Ma discusses his meeting with Trump, jobs, and global trade. Alibaba Group Holding Limited NYSE:BABA [alibabagroup.com] December Quarter 2016 (Q4 2016) unaudited financial results to be reported before U.S. market opens Tuesday, Jan. 24, 2017. January 24, 2017 Conference Call and Webcast at 7:30 a.m. ET (US) / 8:30 p.m. Hong Kong Time. LIVE Webcast replay via http://www.alibabagroup.com/en/ir/earnings. The archived webcast will be available for one week (dial-in number: +61 2 8199 0299; conference ID: 48066090). December Quarter 2016 Results Press Release and Presentation: In the quarter ended December 31, 2016, revenue was RMB53,248 million (US$7,669 million), an increase of 54% year-over-year. Outlook for fiscal year 2017, "we expect revenue to increase 53% year-over-year." FQ3 EPS $1.30 beat consensus by $0.17. Revenue of $7.7B beat by $370M. $BABA shares opened UP at the NYSE market open on January 24, 2017. Alibaba: Do You Know What You Are Buying? 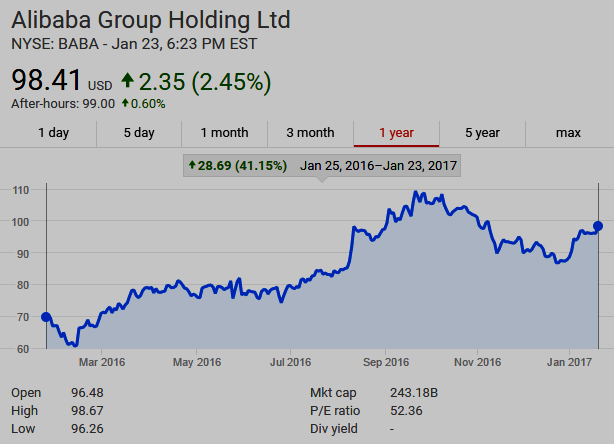 - Alibaba Group Holding Limited (NYSE:BABA) | SeekingAlpha.com: "What exactly do you buy when you purchase Alibaba stock? As it turns out, this question is difficult to answer. What is easier to address is what you do not own when you buy Alibaba." UK Prime Minister Theresa May will hold talks with US President Donald Trump in the White House this coming Friday (Jan. 27) on issues such as trade and security, with the UK Prime Minister being the first foreign leader to meet the US President since he took office. She told the BBC that the special relationship between the two countries enabled her to raise difficult matters. Donald Trump: I’ll do a deal with the UK: "Donald Trump will offer Britain a quick and “fair” trade deal with America within weeks of taking office to help make Brexit a “great thing”." --The Sunday Times | thetimes.co.uk Jan. 15, 2017. Bannon and Kushner engineer UK meetings | Axios.com Jan. 21, 2017: "Donald Trump will take his first foreign leader meeting as President with British Prime Minister Theresa May ... A senior source tells Axios that Trump's chief strategist Steve Bannon played an important role in pushing the meeting to happen earlier than originally planned. Bannon has also been in contact with Boris Johnson, the British Secretary of State for Foreign Affairs and one of the chief cheerleaders of the Brexit movement. Jared Kushner was also very influential in the process, we are told ..."
"The US is already Britain's second-largest trading partner by country, after Germany. Trade between both countries is already more than 150 billion pounds ($186 billion), and the US is the single biggest source of inward investment to the UK, the [UK] embassy said." --CNN.com Jan. 22, 2017. EU Populists See Trump Victory as Beginning of End for Old Order | Bloomberg.com: "While a meeting of the populist right would once have been dismissed as a sideshow, Trump’s unexpected rise and the U.K.’s decision to leave the EU in last year’s referendum have focused investors’ concerns on the where the next threat to the European Union project might emerge. “The first major hit on the old order was Brexit,” Le Pen told a couple of hundred cheering supporters in Koblenz’s conference center. EU countries will soon “leave the prison of Europe,” she predicted, branding Merkel’s decision to let almost a million migrants into Germany last year “a catastrophe.” Trump himself has called the move “a catastrophic mistake.” Hammering on the key themes of her election campaign, Le Pen said every member of the euro area must have the possibility of leaving and that the shared currency [euro] is “destroying” the French economy." • Inside the Trump White House: "Mr. Priebus [White House Chief of Staff] is navigating a West Wing crowded with powerful figures in their own right, including the president-elect’s son-in-law, Jared Kushner, who will always outweigh anyone else regardless of title; the chief strategist Stephen K. Bannon; the counselor Kellyanne Conway; Vice President-elect Mike Pence; and the economic adviser Gary Cohn, the blunt former Goldman Sachs executive who is rising fast in Mr. Trump’s circle."--NYTimes.com. Also: Warren Buffett Supports Trump on Cabinet Picks‘ Overwhelmingly’ | Bloomberg.com. • EU corrupt or just inept? Spain’s Banks Openly Flout the Law Like Never Before | WolfStreet.com: "...“We probably have the best mortgage system in the world,” explained Francisco González, Executive Chairman of Spain’s second largest bank, BBVA, seemingly with a straight face last week at the annual World Economic Forum in Davos ..." See also: These Are The 3 Main Issues For Europe In 2017 | ZeroHedge.com: "... The EU is built around a massive exporter: Germany ... Neither China nor Russia will be increasing demand for German goods due to their own economic woes. And while Germany has managed to survive thus far by increasing exports to the UK and the US, this is not sustainable ..."
• Memos from Howard Marks | oaktreecapital.com: "Think back to just before ... [the] election. What did we know? The polls were almost unanimous in saying Hillary Clinton would win ... There was a near-universal belief that a Trump victory – as unlikely as it was – would be bad for the markets. So what happened? First Clinton didn’t win ... And second, the U.S. stock market had its best week since 2014! ... Thus two key observations can be made ... First, no one really knows what events are going to transpire. And second, no one knows what the market’s reaction to those events will be. One of the key conclusions we should draw from the surprises of 2016 is that the pundits often failed to understand people and their views. It’s clear that people who work in the media hadn’t understood many average Americans ..."
• Cutting Cash Would Be a Boon for the World’s Poor, Rogoff Says | Bloomberg.com: "The Nordic nations all rank among the least corrupt and most transparent in the world. Cash accounts for less than 5 percent of the money in circulation, making them the least cash-reliant group of countries on the planet. “If you do financial inclusion the way you’ve done it in Denmark for example, where you give everyone free debit cards, it would help a lot of problems,” Rogoff said in an interview in Copenhagen on Thursday, after speaking at a Skagen Funds conference. “I think the poor would be among the biggest beneficiaries.”" See also These are the Countries with the Biggest Debt Slaves, and Americans Are Only in 10th place | Wolf Street.com. • Obama Presidency postscript--nice guy, good golf partner, failed President--among Obama's many failures: Obamacare, Syria, Libya ... and Education: Obama administration spent billions to fix failing schools, and it didn’t work | WashingtonPost.com. Video above published Jan 17, 2017 -- Russian President Vladimir Putin: ".... I am not acquainted with Mr. Trump, I have not met him, I do not know what he will do in the international arena so I have no reason either to attack him, criticise him for something or defend him ... But these false stories are utter nonsense ... When Trump came to Moscow a few years ago, he was not a politician and we did not know about his political ambitions. He was a businessman, one of the rich people in America. Does anyone really think that our security services chase every American billionaire? Of course not, it is complete nonsense ... Trump arrived [in Moscow] and immediately went to meet with the Moscow prostitutes? First, he is a grown man and secondly, he is a man who was engaged in the organisation of beauty contests and communicated with the most beautiful women in the world for many years. You know, I can hardly imagine that he ran into a hotel to meet with our girls with low social responsibility ... Prostitution is a serious, ugly social phenomenon because many women are involved in it as they have no other way to provide themselves. And it is pretty much the fault of the society and the state. But people who make-up such falsifications that are currently spread about the US President-elect, that are invented and used in the political struggle, those people are worse than prostitutes. They have no moral restraints."